Whether you have some experience with Tableau software or are just getting started, this manual goes beyond the basics to help you build compelling, interactive data visualization applications. Author Ryan Sleeper, one of the world’s most qualified Tableau consultants, complements his web posts and instructional videos with this guide to give you a firm understanding of how to use Tableau to find valuable insights in data. 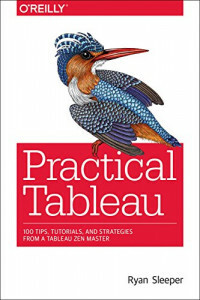 Over five sections, Sleeper—recognized as a Tableau Zen Master, Tableau Public Visualization of the Year author, and Tableau Iron Viz Champion—provides visualization tips, tutorials, and strategies to help you avoid the pitfalls and take your Tableau knowledge to the next level.